If you'd like to obtain a steady stream of new customers and increase the quality of visitors to your site converting more of them to sales, then I suggest that you read on. This could very well be the most important web page you will ever read. Even now, everything I read and hear suggests that if you're not at the top of the search engines you'll have few visitors to your site. If you don't have a domain name then the magazines suggest that you'll get little or no business. You've got plenty on your plate right now and the Internet is more of a distraction than an income generator.To be quite frank with you that's exactly how I saw the net. For starters how was I ever going to get to the top of the search engines. Everyone wanted to be up there. Don't you? But what I couldn't get my head around, was the idea that anyone would be able to find my product, after all if I just invented the wheel how would you find me? You see for a number of years I had been designing leather cases for personal organisers and then along came a new handheld organiser called the Palm Pilot. I designed a small leather case called the WRAP and then through 7 PIMS (7_PROFITABLE INTERNET MARKETING SOLUTIONS) I achieved what most would have thought impossible. In 1996 I invested ($200) in my own website www.i2iuk.com, which I sold out in 2002 to a company called expansys. Since then, I've had sales in excess of (almost $1,000,000). through Profitable Internet Marketing. You can do the same right now using the 7 PIMS manual. No matter if you sell a service or a product, the results are the same. What really got me going was the time element attached to marketing my clients sites. 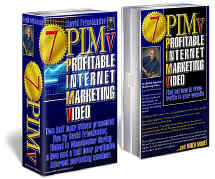 You can do it the hard way and spend many a night at the computer screen trying to figure out what to do next or you can work smart using the 7 PIMS manual and finish up with a step by step manual that will guide you along the journey to profits or you can pass it on for someone else to follow. Of course you could do it yourself, learning the hard way, but then your time is probably more valuable than that. With the 7 PIMS manual it's like having a one to one consultancy with me. Of course I'd charge you ì°°0 a day. Using the 7 PIMS manual I'm not present physically but I'll be guiding you through the process in your own time.. Even if you could find someone to do the site for you, you've still got to write everything down or tell someone what you want to sell and what you want to do, and that's just the start. Once you've got your web site designed, you've got to achieve quality traffic to your site and now! Find out how to feed off your competitors legally! Discover how to get unlimited amounts of new contribution, news and articles to your site, for FREE! Getting the site designed with the user in mind is fundamental in helping the visitor to stay on your site. How many web sites have you been to and left because you don't know what they do? To help you overcome these problems and many others, I've created a manual that literally takes you on a step by step process through what I describe as 7 PIMS. Incredibly, my achievements were without the use of search engines. I have many other easier ways and often more effective methods of attracting traffic to my web site. Using the 7 PIMS manual you can do the same. I've spent many hours writing a simple user friendly guide that takes you, step by step through the marketing process. I'll help you define exactly what your business does in as few words as possible so that your visitors stay, ponder and buy from your site. You'll learn how to make the site STICKY! Which means there's more chance of a sale and more likely hood that they'll return. Keywords are important - I'll show you how to come up with the right keywords and how to choose them so that search engines find you, because you're more relevant than your competitors. You need authority - This refers to the knowledge that you have and can demonstrate on your web site. The more information you can show, the more authority that you evidently have. The more authority that you have the more likey that your visitor will buy from you! I know what it's like, you want to get more traffic to your site, but because you feel you've got a unique product or service no-one can find you on the search engines. You don't know how to get to the top of them anyway, not to mention the fact that it all seems so complicated. We have just completed negotiations on a contract with Screwfix in excess of à°« for both our fire fighting and gardening products. They contacted us through the website (DSF assisted in marketing and designing last year) and told us if it wasn't for the fact that we had a website like we have, they would never have gone into business with us. This is an excellent result! I'll uncomplicate the whole process. You see, I got to thinking as time went on, that with all the hype out there, the one thing that no one was prepared to do was to tell you "Step one, do this, step two do that", etc. So having achieved the success on the net, which is more than I can say for most, I figured that if I could put a really comprehensive, no jargon and user friendly manual together, then you'd buy it. Let me point out right now, this is "no ordinary full of theory manual." NO. This is a work book. A do it yourself step by step instruction manual. Sure, you could get someone in to promote your site. I'll do it for you if you're willing to pay my fees! 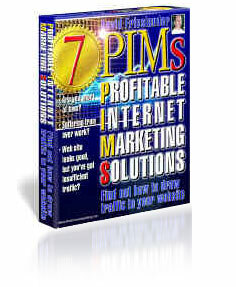 By following the 7 PIMS manual step by step, page by page, you'll save valuable time and money. Unlike my competitors, (if I can call them that), I don't just leave you with a book full of theory. I send you a practical, easy to follow workbook and two half hour videos. They'll help make your job a lot easier. Just complete the workbook and then pass it to one of your staff and get them to do the work, step by step. It will save you literally thousands of dollars, pounds or any other currency. I've bought that many manuals and theoretical ideas that I can personally tell you, there's nothing like this anywhere. Not one of the manuals I've seen say "first do this then do that". Their just not willing to put their reputations on the line. "Mindblowing couple of hours, Full of Great ideas!" "Can't wait to get started!" If you were to achieve the sales and visitors that I've had to my sites without the use of the 7 PIMS manual I would be surprised if you could do it in three years! This workbook will take you by the hand and guide you, saving you at least 40 hours a week, probably more. How much is that time worth to you? Once you've worked through the many exercises that I've created for you, brainstormed the campaign and completed the 7 PIMS manual you'll have a comprehensive step by step marketing strategy that you can give to anyone to implement for you. A flow chart that will help you deal with your visitors' enquiries and leading them to make a purchase. Until recently, the only medium that I could use to put over the ideas contained in the 7 PIMS manual would be seminars, one to one consultancy and articles that would appear all over the UK in newspapers and journals. 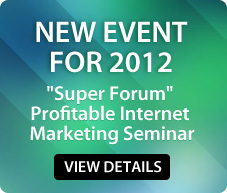 "The best seminar on Internet Marketing that I have so far attended." "Excellent tips on how to use the Internet to your advantage"
"An excellent introduction to Internet selling "
Those individuals that have followed my principles can't believe the difference that I've made. But don't just take my word for it - here are genuine comments from just a small selection of my clients who have attended my seminars and experienced consultancy using 7 PIMS. "Full of practical and useful information on how to market on the Internet and obtain results without spending a large amount of money"
"If the cheques flow in as fast as the work, I've cracked it! It wouldn't have happened without your help"
"thanks again for your valuable insight into Internet Marketing, All the best"
"Full of new inspiration and new ideas I am in the middle of writing my evaluation of my company's web site based on your wise words during the seminar at the Rembrandt hotel in London." I've many more testimonials than I've got here and I'm rather flattered that so many people really appreciate my 7 PIMS. To be honest I'm rather shy about the success that I've had on the net, but I recognise that you're out there blinded with the information overload that everyone keeps putting out. "This was obviously such an excellent meeting that the delegates want to repeat it! " "David thank you for such a stimulating series of working ideas, you obviously have a lively mind"
"Now I know why I'm getting no traffic, thanks David"
Do you just want someone to show you the very simple steps involved in marketing your website? Do you just need some straight forward do this do that type of advice? Are you looking for straight answers to relatively simple questions? With the 7 PIMS manual you'll have that straight talk no nonsense approach you really want. The 7 PIMS manual has been selling for é¹®00 and believe me it's worth far more than this, my daily charge to my clients is never less than à°° per day! I've packed everything into this 7 PIMS work book, keeping it simple, concise and above all a practical no nonsense work manual that anyone can follow. Until the manual is available in an electronic format to download, which it wil be very shortly, I've put together a Frieslander Package that I know you'll want to get your hands on. Here's the deal; I'll send you my 7 PIMS manual which until recently sold for é¹®00. That's a fraction of the previous price and to be perfectly honest my staff told me I'm nuts! They said "what are doing giving so much for the money, after all the sort of advice I'm going to share with you costs most of our major clients thousands of pounds to acquire!" My competitors are not going to like this, but.... I'll send you the manual in printed bound form and and I'll have my staff include bonus copies of my Profitable Internet Marketing seminar videos worth another é®°0. I'm working on the electronic manual right now and once I make it available there's no way I'll be prepared to offer this deal again. When you place your order, I'll add you to my mailing list and let you know of the latest deals and offers around. Look, if for any reason you don't agree that I've given you excellent value, a step by step marketing strategy or a value for money package, just return the package and I'll just refund your money. Here's a thought, don't decide now if this products for you. Place your order today. I'll have the staff parcel up the 7 PIMS manual and the 2 video tapes in a beautiful presentation case and send it out tonight first class. At the absolute worst, you'll get all your money back less the shipping cost. P.S. You've only got a few days left. Once these packs are gone, I'll not be offering this deal ever again.